CRAFT RECORDS, the small, ultra-mobile sub-label from the actionist camp of Sabotage Communications, is celebrating its 50th release! Reason enough to duly commemorate the occasion with the ultimate sampler: CRAFTLER. 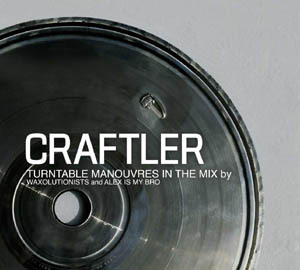 For a double mix-pack, consisting of over 32 selected, tried, and tested top Craft trax of the last few years, experts like turntable wizards WAXOLUTIONISTS and the "black belt electro grandmaster" ALEX IS MY BRO were invited to create their own mixes. The result, united on a double CD, is definitely worth a listen! WAXOLUTIONISTS, the Viennese DJ-crew featuring Buzz, Zuzee, and Meister Pez, turn up the heat full blast on the first CD, and deliver dope beats, hip-hop, groovy breaks, and scratches of the highest caliber. On the second mix CD, ALEX IS MY BRO uses the electro-whip to lash a path through the wide world of club- and nano-techniques.